The Komondor is bred as an independent guard of livestock and holds true to its heritage. This breed of dog is an extremely independent thinker and can often times be stubborn and dominant. The Komondor is not an ideal dog for someone who may be a pushover when it comes to their pets. This breed of dog can be very domineering if its owner is not stern with it. The Komondor needs consistent socialization for its well-being. It is very reserved around strangers and tends to be hostile towards other strange dogs. However, the Komondor interacts rather well with other pets and specifically livestock. It is in its happiest state when it is watching over someone or something. While its personality can often be calm and quiet, the Komondor is absolutely fearless when a situation arises where it needs to act as a guard dog. In this sense, this breed is extremely protective of its family and may sometimes misinterpret playful tumbles with children. The Komondor has to participate in daily exercise, whether in the form of a long walk or a short romp. This breed of dog does not like warm weather in any sense. It can easily live outdoors in temperate to cold weather. The Komondor is not a carefree dog breed. It takes a lot of time and effort to care for this type of breed. It may be difficult to keep its coat clean, as its hairs tend to collect dirt and other particles very easily. Bathing the Komondor is an extremely time consuming task and can take up to even an entire day just to get its coat fully clean. The Komondor has a life span of ten to twelve years. There are a variety of health concerns associated with this breed of dog. Some of the major health concerns include CHD and gastric torsion. Some of the more minor health concerns seen in the Komondor breed are otitis externa and hot spots. Entropion is occasionally seen, but not nearly as often as the major and minor health concerns. It is suggested that this breed has regular hip tests to prevent from any damage. 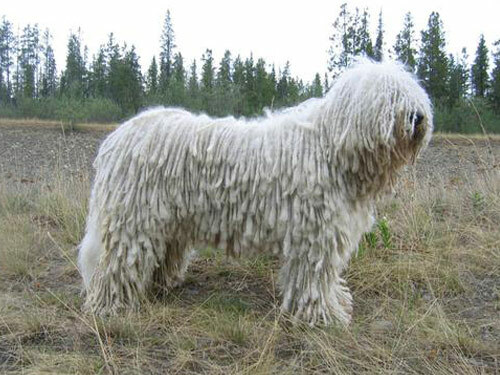 The Komondor comes from the Russian Owtcharka, which was brought to Hungary by the Huns. This large, long-legged breed became the progenitor of the Komondor. These breeds share a similar resemblance to the Racka, the Magyar sheep that had a proud dog-like carriage and ample amounts of curly wool. Because of the similar appearance, the dogs easily mixed in with the sheep and often appeared to be one of the herd. Because the Komondor breed was so immensely valued by the Magyar shepherds, they were not permitted to interbreed with other breeds. It is assumed that the breed existed long before 1555. This breed earned its keep by guarding the flocks against vicious animals. Some say that the Komondor breed was even responsible for wiping out the wolf population in Hungary. This breed was still used as a guard dog well into the twentieth century. The first of the Komondor breed finally came to America in 1933, and then received AKC recognition in 1937.